petição: This Woman Dragged Her Tiny Dog 'Mama' on an Electric Scooter! This Woman Dragged Her Tiny Dog 'Mama' on an Electric Scooter! A horrifying account and photos have just come out. Apparently, a woman had tied her small dog to a Bird electric scooter and then dragged it behind her for at least 100 yards. 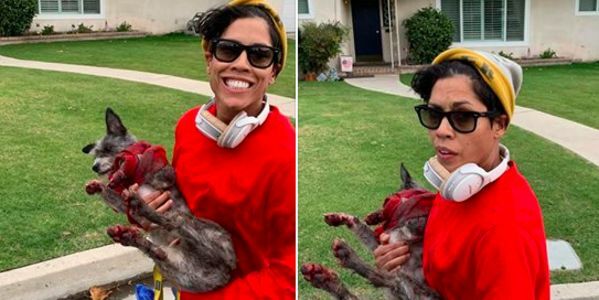 Sign on to make sure Bakersfield police are doing everything they can to catch this animal abuser and bring her to justice. Witnesses took photos of the woman holding the tiny dog, maybe a chihuahua or something similar who she called Mama, and all four of its paws are bloodied from being dragged. When one couple saw her pulling the dog, they confronted her and told her to stop, to which they said she replied "sh*t happens, just like with kids." Yikes. This is a woman who should definitely not be allowed to care for dogs or children. Thankfully, Mama was picked up by animal services and is expected to make a full recovery. At least one other person saw the incident and filmed it and posted on FB. This is truly a heinous act of animal abuse, with apparently no remorse or even awareness of how torturous it was for the dog. The local authorities have opened an investigation, but sometimes animal abuse cases get pushed to the bottom of the pile. Will you sign the petition to make sure police know it's critical that this woman is found and brought to justice? We know that there is a strong link between animal abuse and human abuse, which makes it even more important this woman is found immediately.